Whether asking students to engage with class-assigned texts or books of their choosing during independent reading, I’ve always struggled to get students interested in being readers. And why should they be interested? Because-the-teacher-said-so works for very few students. Then when a text challenges students, its subject matter is “boring,” or their cell phones are mere inches from their itching finger tips, because-the-teacher-said-so just simply won’t cut it. Telling students to think about their thinking piques their interest as we start our class each year. Showing them that we all approach and experience a variety of texts in our own way allows them to understand there is no one way to be a reader and a thinker. Showing students it’s ok to not know everything and to ask questions is a valuable part of being a reader. Promoting metacognitive strategies in class also tells students that their individual experiences matter and are valuable. In my English classes, I most intentionally employ metacognitive strategies during independent reading. Students bring a book of their choosing to class on Fridays and are instructed to read for a given amount of time (25 minutes in quarter one, 30 minutes in quarter two, etc). 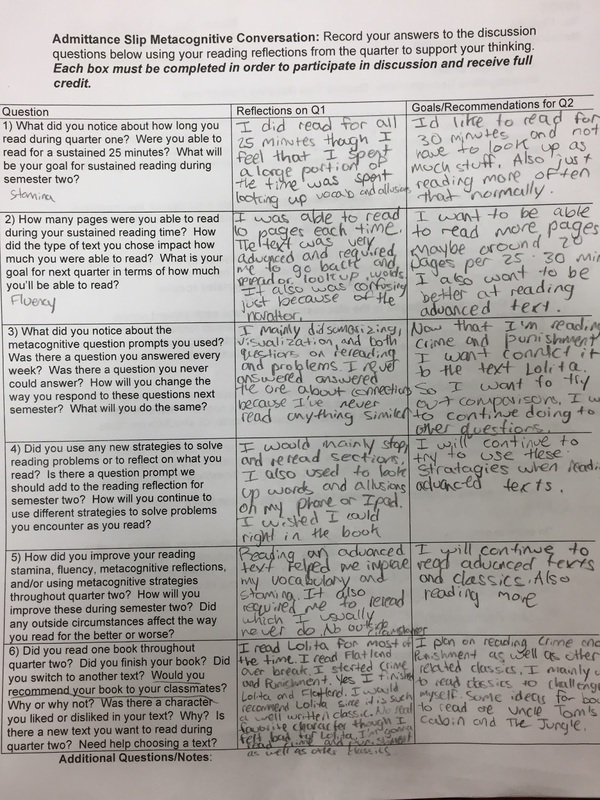 Once they’ve read, they complete a metacognitive reflection, answering five out of seven questions that applied to their reading experience that day. 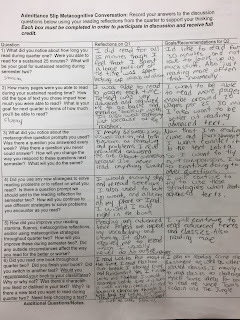 Each quarter we make improvements to the reflection sheets so that students can use them in ways that make most sense to them as critical thinkers. Now, how can I assess students’ thinking and reflections in a meaningful way? The metacognitive conversation. Each quarter, I return the students’ reading reflections all at once. They get to look through their reading experiences from the last ten weeks and reflect on their progress, problems, and evolving thinking. Using their own reflections as evidence, students prepare for our summative assessment: the metacognitive conversation. 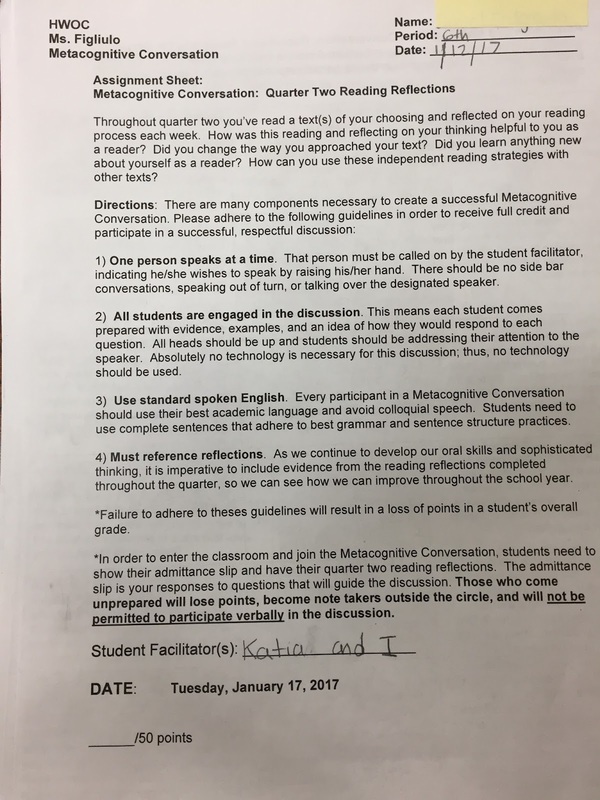 Students must prepare for the metacognitive conversation by answering six to seven questions about their reading for the quarter. They must reflect on what they did throughout the quarter and then set goals or propose solutions to their reading road blocks for the following quarter. 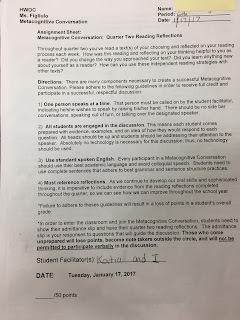 The day before our formal conversation, we review the procedure, expectations, and evaluation [see assignment sheet], then choose two student facilitators to guide the discussion the next day. In order to participate, students must have their reflections and admittance slip (completed questions). During the conversation, students discuss their thinking, approaches to the text, problems they encountered, and make recommendations to each other about text choices or methods. At the close of the conversation, students complete a self assessment of their performance during the discussion. Their reading reflections, admittance slips, self assessments, and my notes make up their final grades. 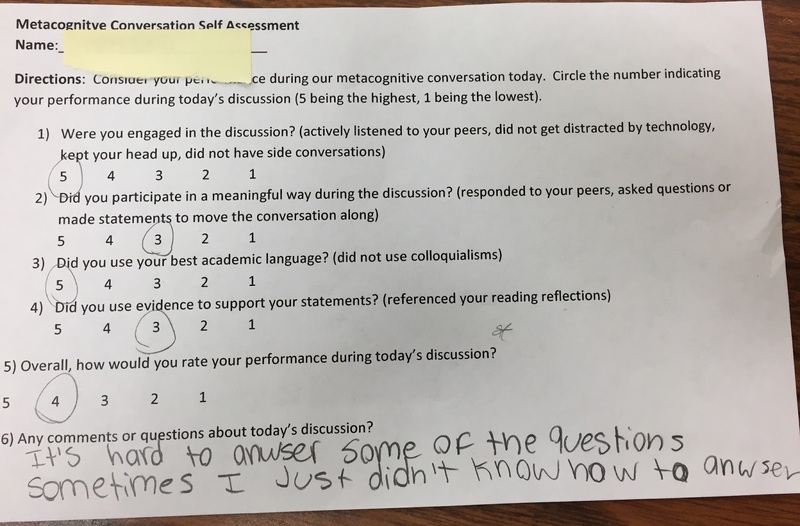 The metacognitive conversation is a valuable, focused evaluation of one of my overarching quarter learning targets: students will be critical thinkers of texts and their own thinking. It allows students of all reading levels to show growth and be measured on their own personal progress. 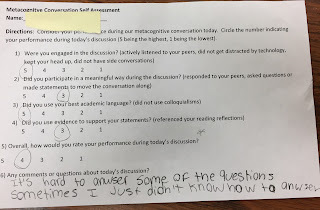 Another benefit of using metacognitive strategies and this method of assessment is the community it builds in our classroom. I come to know how my students think as individuals and can use that to inform and differentiate my instruction. Additionally, students get the chance to relate to one another as academics, not just as peers sharing the same space each day. I continue to struggle with intentionally embedding metacognitive strategies in all parts of our curriculum. I hope to create a classroom where individual, critical thinking becomes the class norm, not just something we do on certain days. However, the metacognitive conversation days give me hope that my students and I are at least on our way!